As a young reporter in Eastern Europe in 2001, I expected to witness the “end of history” and the flowering of democracy. That was just one of the mistakes I made. The end of history — that is, the American 1990s — came for a handful of reporters in Belarus, where the big story of Sept. 10, 2001, was the flowering of free markets and democracy with a capital D.
The country was then known as Europe’s Last Dictatorship, a backward, Soviet-style state ruled by a giant former collective farm boss, Alexander Lukashenko, who towered over the nation’s politics. An election was scheduled for two days before 9/11, and correspondents from every major Western news outlet had gathered to cover it, and — perhaps — to watch the final communist domino fall. I was then a lowly “stringer” for the Wall Street Journal’s European edition, based in nearby Latvia. As such, I was probably the most clueless reporter who had attached himself to a brand-name outlet to cover the curiosity of a dictatorship hanging on between a booming European Union and a modernizing Russia. I was 24, and as a true child of the 1990s, complacent about the direction of history in a way that made me a particularly bad reporter. I recognized myself in Suzy Hansen’s recent book on the delusions of our generation of Americans abroad, Notes on a Foreign Country. “I would never have admitted it, or thought to say it, but looking back, I know that deep in my consciousness I thought that America was at the end of some evolutionary spectrum of civilization, and everyone else was trying to catch up,” she wrote. That was certainly the operating thesis of the Journal, where the real prize for a freelancer like me — $1,500, a slot on the front page, and special internal prestige — was the “A-hed,” a long, colorful feature whose distinctive design resembles the letter “A,” and which remains today a key feature of the paper’s front page. The point of an A-hed, I had gathered from afar, was to gently amuse the Journal’s audience with a story about some harmlessly misguided attempt to resist the march of capitalism. On a trip to Belarus in the spring of 2001, I spotted an A-hed candidate: the giant V.I. Lenin Minsk Tractor Works, which employed about 20,000 people in a walled compound in the capital, and produced most of the tractors in the former Soviet Union. The factory, true to its Soviet roots, produced according to its own internal logic rather than to the demands of the market, and fit the bill perfectly. Tractors plowed the snowy streets of Minsk; tractors sat, unused, on collective farms that — unable to afford diesel — plowed their fields with horses. You learn how to be a reporter in large part by making mistakes, and I made most of my worst ones in Belarus. I’ve been thinking about them lately because so much of what we were wrestling with then feels relevant: questions about American and post-Soviet power, about the allegiances and responsibilities of reporters, and about the power of narratives. I’ve been thinking, in particular, about what I did to a young Belarusian activist named Alexei Shydlovski back in 2001, and when I returned to the subject recently I found I’d been wrong about more than I realized. Shydlovski was 22 when I met him a couple of weeks before 9/11 in a basement cafe that was the best of the small number of restaurants in Minsk. Anywhere other than Belarus, the rigid formality and brusque service would have seemed painfully Soviet. But just a decade after the fall of the Soviet Union, it was too soon for nostalgia. Shydlovski was the press contact for a new group formed to oppose Lukashenko, Zubr, whose slick logo was the silhouette of a bison. But while his campaign had superficial polish, Shydlovski was a little rough around the edges. He was visibly a brawler, a young hockey player in a black leather jacket. His English was as bad as my Russian, so we communicated in a rough mix of both. So it was to my good fortune that Shydlovski was more candid than many of his counterparts among professional revolutionaries around the world. Over water and what passed for salad, he told me he traveled regularly to Poland to receive the covert US government cash that financed Zubr. I wasn’t sure I’d understood him right, so he repeated it in both languages, and laughed. My heart beat a little faster: It was a wildly reckless thing to tell a reporter, and I also knew it was international news. I left the restaurant with the jitters I get when I’m the sole possessor of a hot story. It was the biggest news I had gotten my hands on in my short career. I found a computer at a local NGO and used it to file, hoping I’d get beyond my usual slot on page 27. I never heard from Shydlovski again, but the story went to the top of my clip file, because like most good stories, it got at something true and uncomfortable, in this case about the mechanics of the projection of American power. I felt the thrill of reporting something I wasn’t supposed to know, of telling a story that powerful people wanted hidden. I was sure the US ambassador in Belarus, an old Cold Warrior named Michael Kozak whose previous posting was in Cuba and who seemed to view reporters with skepticism, would be angry. I went home to Riga — a gleaming, bustling Western place in contrast to Minsk — for a few days after my Zubr scoop. When I returned to Belarus for the election, I learned that the US Embassy was indeed furious. Kozak’s deputy, John Kunstadter, took me aside at an informal briefing, courteous but livid. He told me, as I recall, that I had been incredibly irresponsible. My story, he said, had gotten Shydlovski, a good kid, tossed in jail and beaten. That kind of reporting had consequences; I should remember which side I was on. My heart dropped. I had no response to that. Secrets were secrets for a reason; power was not always arbitrary; the two sides weren’t equal; the US government had a point. I mumbled something unsatisfying and not entirely relevant about how he, not I, had put Shydlovski in that position, and walked away confused, humiliated, and feeling guilty. These brutal human consequences of politics felt foreign to someone raised on the verities of the American 1990s, the minor dramas and major victories of the Clinton presidency. I was expecting clarity, triumph — that sense of manifest eastern destiny. I didn’t follow up. But over the years, I thought about Shydlovski a lot, googling him fruitlessly from time to time, worried about what had become of him. And at times, I applied the lesson and took the edge off my reporting. 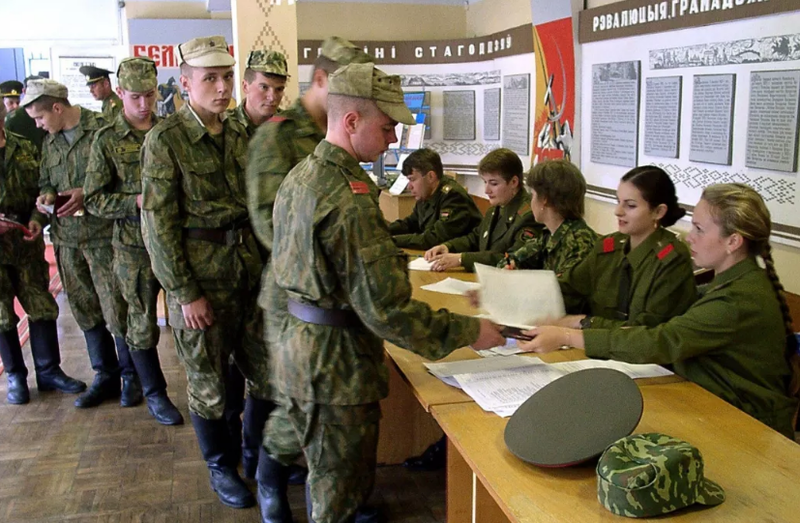 Belarusian soldiers receive their ballot papers at a polling station, Sept. 9, 2001. I’d landed in Belarus pretty much by accident in 2000, after a stint in Indianapolis and a failed attempt to get to Prague, where a generation of curious young Americans was exploring the post-communist frontier. Minsk didn’t have the comforts of Prague, but it had the advantage that there wasn’t much competition for stories. There wasn’t really a foreign press corps. In fact, the only permanent member I recall was a tall, kind British guy who wrote under an assumed name because he was officially there teaching English. During my first trip to Belarus, I was able to pick up a story the Journal really cared about, the planned closure of a plant making minivans for Ford. As the election approached, I thought my time there gave me an advantage over the other correspondents who began arriving — from Moscow, Washington, and London — about a week before the vote. We strolled the empty boulevards, marveled at the statues of Lenin and of the notorious founder of the Soviet secret police, Felix Dzerzhinsky, which stood outside the headquarters of the KGB, as it’s still known in Belarus. I vividly recall visiting a rural shop whose stock was down to a few sad eggplants. We gawked, and the younger among us were able to conjure the old Soviet Union, the great story my generation had just missed. We shared the consensus view about President Alexander Lukashenko and his antiquated regime. “We were all reveling in the last dictator story. It was an anachronism and it too would eventually move in a more democratic direction,” recalled John Daniszewski, who was in Minsk that day for the Los Angeles Times and is now the VP for standards at the Associated Press. I was thrilled not just to cover some real geopolitics, but also to catch a glimpse of the journalistic stars I hoped one day to emulate: Daniszewski, Michele Kelemen from NPR, the Economist’s Ed Lucas, the Washington Post’s Peter Baker and Susan Glasser, reporters from the New York Times and the Guardian, and also from the end of a newspaper era — the Baltimore Sun and the Christian Science Monitor. Though the local opposition was clearly weak and disorganized, the forces of history were on its side. And we were confident that Lukashenko wouldn’t be around long. The European Union and NATO were finalizing their move to the country’s Western border, building new glass skyscrapers in Warsaw and gleaming urban renewal projects in Riga and Vilnius. To the east, Moscow was the glitzy center of a rough but — we were assured by the conventional American wisdom of the “end of history” — inevitable march toward democracy and capitalism. Belarus President Alexander Lukashenko speaks to the media in Minsk, Monday, Sept. 10, 2001. It was a rout. The US had corralled the fractious opposition into backing a dull compromise candidate, an aging labor leader named Vladimir Goncharik, who never really stood a chance. That rainy September election night in downtown Minsk, we milled around a broad plaza where a handful of college kids and pensioners had turned up for Goncharik’s concession speech. The hulking riot police, armed with Kalashnikovs, dwarfed and outnumbered them, and shoved the protesters around at any opportunity. Goncharik tried to speak and they cut his sound. “If you were going to come out onto the streets one night in the last seven years, tonight was the night,” a young software engineer who had joined the crowds told me, with tears in his eyes. The direction of history wasn’t quite the one I had imagined. I felt shattered, though I also should have known better: Nothing in my reporting actually hinted at any other outcome. It dawned on me that what I had brought to Belarus from Yale and Indianapolis was laughably inadequate: some bad Russian, a set of clichés about the end of the Cold War, and mostly just expectations about the way things ought to turn out. That night, I couldn’t make them fit the reality in front of me. The next day, we gathered inside a gloomy building known as the Sarcophagus to hear Lukashenko receive endless formal congratulations from visiting delegations from the East, and to take questions from reporters. I was jealous to see Ed Lucas ask a long and complicated question in his excellent Russian. The next year, as international attention focused on Saddam Hussein, Belarus began popping up at the margins of stories about Iraq’s weapons. I felt my face redden reading them. Belarus remains a hub in the business of arming the US’s enemies, most recently accused of doing secret work on the missile program of Syrian President Bashar al-Assad. For years I’ve looked back at the lessons of those stories from Belarus when I approach others: to weigh the effects my reporting can have on people’s lives; to listen for false notes or details that seem too good to be true; and most of all to battle the complacent assumptions of a ’90s kid. I’ve always been haunted by the notion that my own ideology — publish and be damned — got young Shydlovski jailed and beaten. My response to Kunstadter — you put him in this situation, and he knew the risks — sounded good enough, but it was also a kind of statement of inhumanity, the inhumanity of reporting that has become the inhumanity of social media and of the new information wars. There’s an axiom in reporting — crystallized by Janet Malcolm in The Journalist and the Murderer — that at the core of journalism is betrayal. I thought that’s what I’d done to Shydlovski. And I’ve thought a lot about the balance of responsibility to your sources and to your readers. One night last summer, I found myself googling him yet again, when I decided to try some alternate spellings of his name. Up popped an interview with him on a Czech website — in which he mentioned, in passing, that he was lucky not to have been jailed for his beliefs. I couldn’t quite believe it. The Google translation was so rough, the source so obscure, that I accused myself of fantasizing his words in order to expiate my guilt, and I put it out of my mind. But I always think about Minsk around 9/11, when most people are thinking about the moment when they first heard about the attack on the Twin Towers. I was reading Hansen’s book, and I began to think about writing this piece, and I thought I should at least ask Shydlovski himself what really happened. I found him on Facebook, and saw that he had left Belarus and was living with his family in Prague. He had softened with age, but his page was full of pictures of his son in hockey gear, looking as tough as his dad once did. We set up a time to video chat, and I reached him one afternoon this winter, before his shift at a quiet hotel by the Vltava River. He is the night manager; his wife runs a souvenir shop. Shydlovski hadn’t been to jail after my article revealed he was taking US money, he told me. For years after I left, he was an independent, opposition journalist in the country's tiny free press. It was only in 2007 that the KGB began to give him real trouble. He spent 15 days in jail, he said, for speaking out against the regime; around Christmas, he slugged a KGB agent who was harassing him. The man’s fellow agents sent him to the hospital, and as he recovered he was threatened with 10 years in jail. He finally fled the country, taking his wife and son. He chose Prague for his exile — it’s close by, and he figured Lukashenko couldn’t hang on forever. Now he wishes he’d sought asylum in the US. Shydlovski said that he remembered me, but our meeting and my story hadn’t left much of an impression. With his enthusiasm and youth and broken English, he was the best face Zubr had and so he “did 10 interviews in 10 different restaurants” with visiting journalists, though he didn’t tell anyone else about the US government cash he picked up in Poland. Those relationships didn’t pay off. Few reporters stayed to cover the post-election outrage. We scattered as 9/11 rearranged our world: Those who could went to Kabul and Islamabad. I returned to New York, to cover the smoldering pile at Ground Zero for a new local paper. Ruzhana Vecherko, 3, puts a candle outside the US Embassy in Minsk, Wednesday, Sept. 12, 2001. My first impulse was fury, even all these years later: at Kozak, the ambassador, and his deputy Kunstadter, who had — in my recollection — lied to my face. This was another kind of mistake, another lying government. I quickly found Kunstadter through his website, where he posts black-and-white photographs of the idyllic Belarusian countryside, a project that appears to have consumed him since he left the foreign service in 2005. I found his address on a quiet Washington street and his phone number, and left a series of messages with his wife and on their answering machine. To my surprise, he never responded to that or to an email to an AOL account associated with his name. I was, however, able to track down Kozak, who replied quickly to an email sent to the formula State Department address. When I reached him on a recent Friday, he said he was on the top floor of the grand old building at Foggy Bottom and grumbled about how cold it had gotten since they removed the radiators in a sustainability push. I told him why I was calling, and how confused I was by the lie I’d been told all those years ago. He didn’t evince much surprise. Kozak didn’t recall the incident and didn’t think I’d done anything particularly wrong. “If [Shydlovski] told you that on the record, you had the right to print it,” he told me. Kozak, who now runs State’s Bureau of Democracy, Human Rights, and Labor, laughed at my old perception of him as a professional Cold Warrior, which had also been the official Belarusian government line. He’d been sent to Belarus, he said, by Clinton’s deputy secretary of state, Strobe Talbott, on the grounds that he’d learned in Cuba how to navigate a hostile communist bureaucracy. He’d been fully aware of the arms dealing — one of his key assignments was to block the sale of an anti-aircraft system to Saddam. They had set up a control room to fight the aftermath, and Kozak was just leaving it the next day when someone told him that a plane had crashed into the World Trade Center. Lukashenko rushed to express his sympathy with the Americans, and that was that. I was gone by then. I had left Belarus on an overnight train the day after the election, and crossed the Ukrainian border on the morning of Sept. 11, as clear a day in that region as it was in New York. That afternoon, I sat in a Kiev newsroom watching my past assumptions about American power crumble, and walked outside to watch Ukrainians lining up at exchange bureaus to turn in their dollars. The story moved on. Kozak, though, stuck around; he’s still working on the Lukashenko project from his desk in Foggy Bottom. And his own experience, he said, had taught him not to trust confident judgments about the future of an authoritarian. And Kozak is right: The main lesson I should have learned was about making predictions, about trusting the confidence of my American culture and of official sources on both sides, of imagining I knew more than I did. Even in the era of Steven Spielberg’s The Post and of a kind of glorification of the work of journalists, good reporting doesn’t offer easy lessons. It’s an uncertain business, and a necessarily anarchic one. Now I’m glad I wrote Shydlovski’s story, not despite the fact that I didn’t know where it would lead, but because of it.